Craftwell posted this picture on their Facebook page....and this is only part of the vinyl surprises they have in store for us! 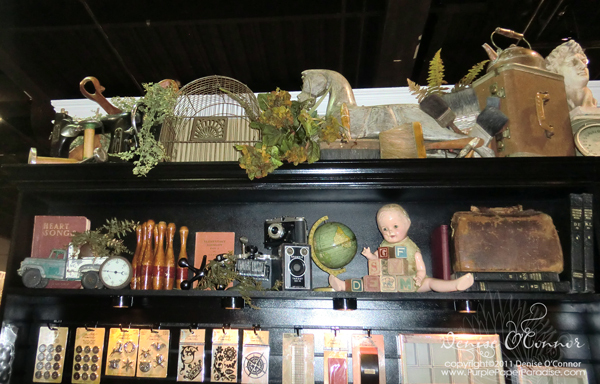 CHA Inspiration with Ranger and Tim Holtz! Sorry for the delay in getting this post to you, but there has been sickness in the house, so that has stolen a lot of my time lately. Whatever free time I had, I have spent crafting and playing with all the cool new features on Make the Cut. 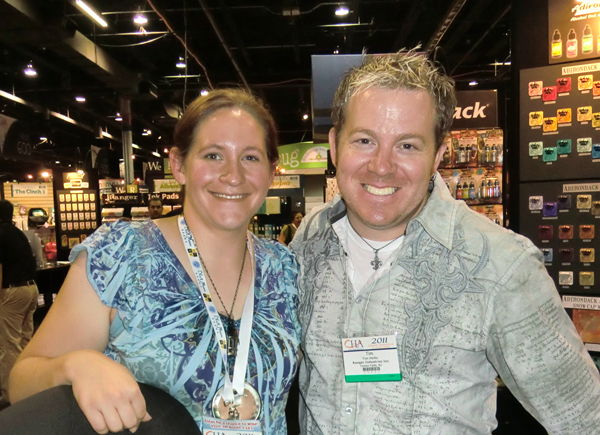 I will share more on that later, because today, I just have to share my experience in the Ranger booth at CHA. 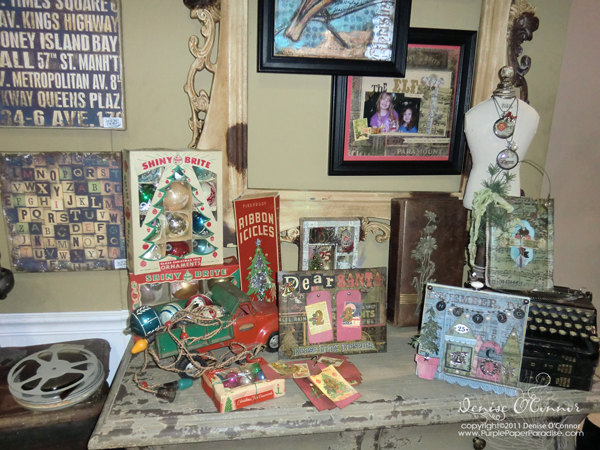 First off, I just love the eclectic style that Ranger and Tim Holtz put together in the booth. Just amazing!! 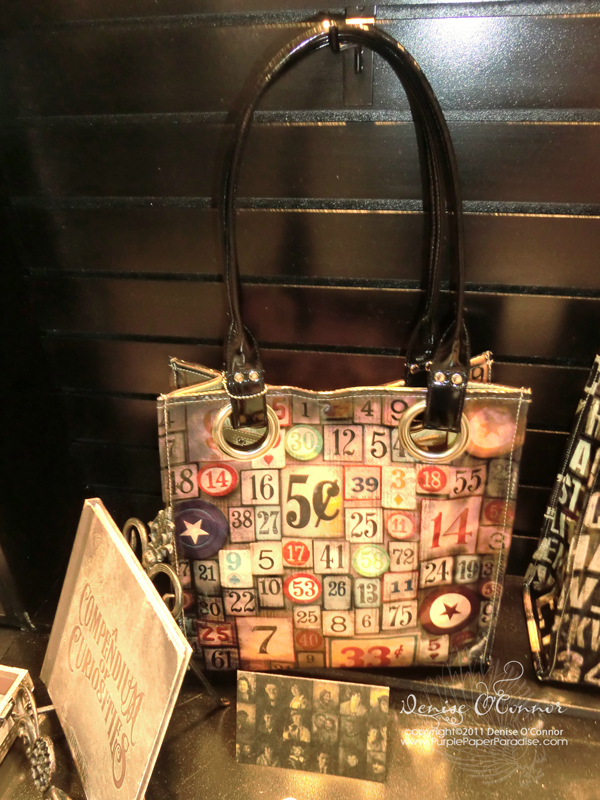 I think I am in love with this tote from the new District Market line! 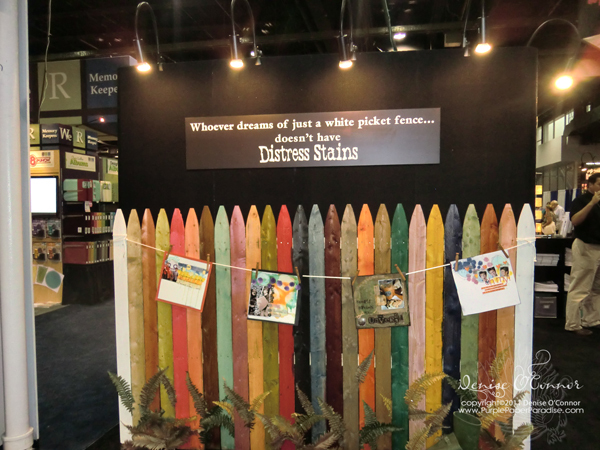 I thought that this was such a creative way to introduce that they are now selling Distress Stain in all the Distress colors and added a white color called Picket Fence. While I was exploring all the goodies at the booth, I was able to catch Tim himself doing a demo with Distress Stain and the new Picket Fence color. Simply amazing! I can't wait to get it and play for myself! Tim was such a sweetheart and even let me get a picture with him! What a great day at CHA!! 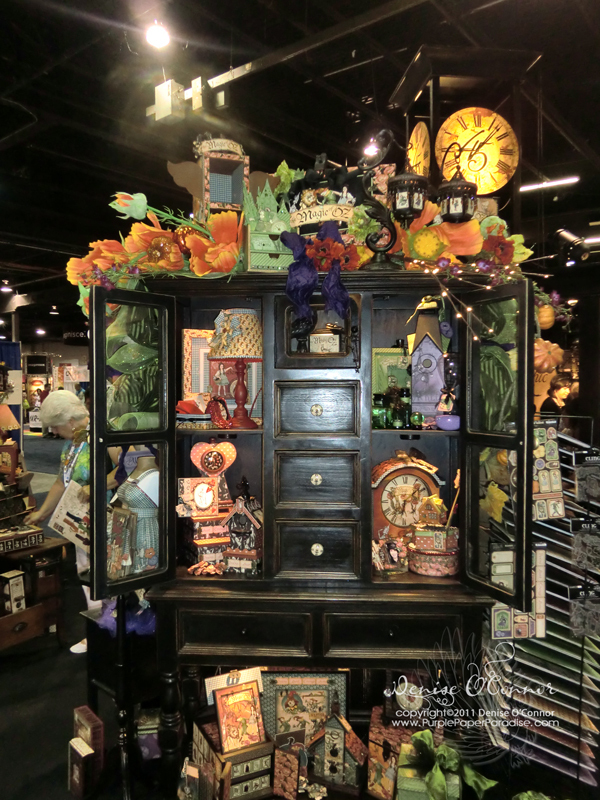 I will have another CHA post here soon with some of the other wonderful things at the show! One thing that I quickly figured out at CHA is that the place is FILLED with inspiration! 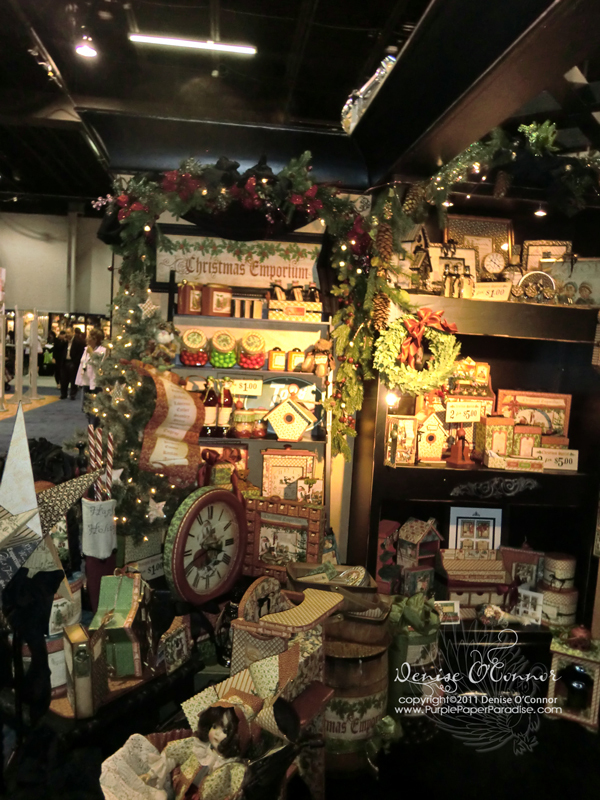 One of my favorite booths at the show was Graphic 45's. I cannot even explain to you how inspired I was by all the projects on the display there! Their new paper lines Christmas Emporium and ABC Primer are fabulous! Kim already has them up in her store for pre-order HERE, so if you love Graphic 45, grab them quick! Here are some of the pictures that I took in their booth. Here is showcasing the Christmas Emporium line. 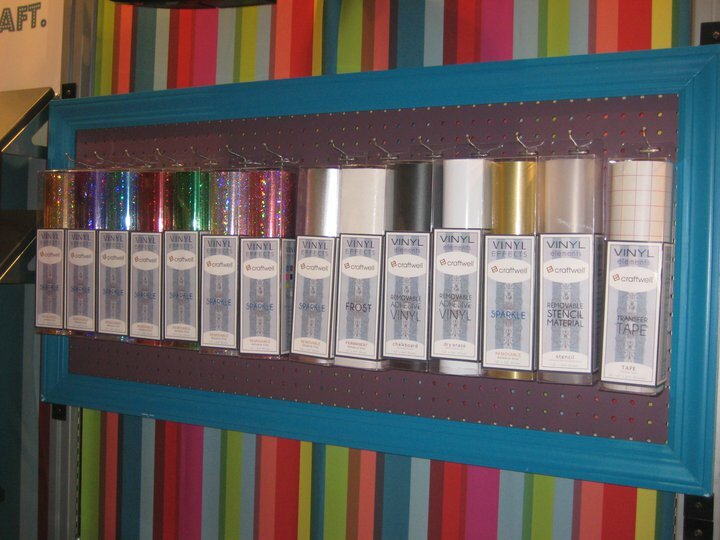 Almost everythiing you see in this picture has been adorned with this gorgeous paper! They have advent calendars, clocks, birdhouses, ornaments, that high chair is covered in their paper. Even the "blanket" in the cradle with the baby is made out of their paper! Just amazing! 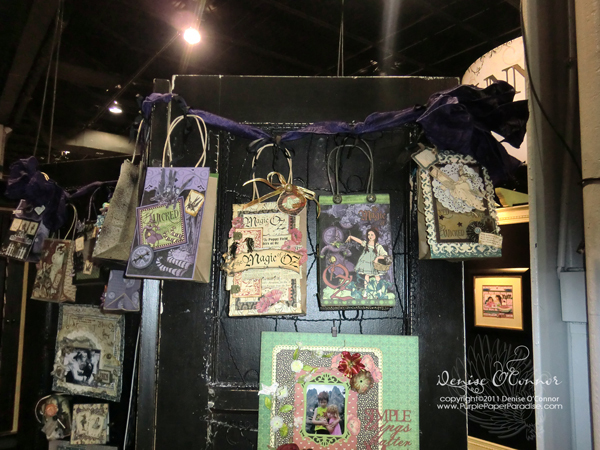 These next few pictures showcase the Magic of Oz paper collection (get it HERE) and in the above picture, they adorned all sorts of home decor items with this paper. I just LOVE these gift bags!! 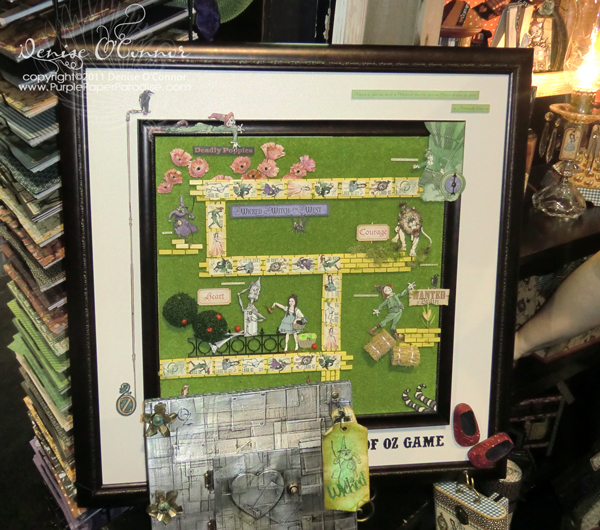 This game board made out of the Magic of Oz paper was just gorgeous! I would love to have this hanging on my wall! Did you catch the little ruby slippers? Adorable!!! So last night, I was going to work on a post for you guys about some more exciting news from CHA and got completely distracted!!! It's all good though, because Andy over at Make the Cut released a BETA version of version 3.3 and WOW!!! HERE is the link to the forum where he posted the download for Beta 3.3 and also the impromptu webinar that he did last night that showcased the new features in this version. Make sure you download and watch the webinar, because there are so many little changes that will make things a lot easier! I will still post all the stuff about CHA, but please give me some time!! I am having too much fun playing with the new MTC! I have had a busy blogiversary week because I was at CHA!! This was my first time going to CHA and I have to give a HUGE thank you to Kim at the Cutters Creek store for inviting me to go with her and her design team. I had a blast! Over the next few days, I will be sharing some pictures and sharing some of the new things coming out that I find very exciting! Since I know you are all anxious, I will find you in on my visit to the Craftwell booth...can I say that I am REALLY excited about some of the great things that Craftwell has in store for us?!?!? Ok, I am saying it....WOW! We are all going to be in for a BIG treat! Craftwell is working on adding features to the eCraftshop Pro software and probably the biggest thing that they are adding is something that will help us *BLING* ourselves out! Their vinyl is right around the corner from being released and they have some really cool ones coming out that instantly got me thinking of all the projects that I can do with them! eCraftCentral is going to have some big changes to it too! They are partnering with some amazing people to bring more and more images to the site (they plan on having over 1200 available soon) and they are going to do some re-designing to the site to make it easier for us to search for the image that we want. AND on top of all of that, the eBosser is coming really soon! Right now, they are saying November. If you are not aware of the eBosser, well let me fill you in! The eBosser is an electronic die cutting/embossing machine that can take ALL types of metal dies. Craftwell just re-designed the machine so that it can take the thick metal dies all the way down to the wafer thin dies. This re-design also allowed them to reduce the footprint of the machine so it will be easier to fit in your craft space. Since it can cut 8 1/2" wide, it will take even those huge Spellbinders dies. Yippee! For me, the most exciting part, is that they are going to be making several large embossing folders to go along with the machine so that we can emboss both front and back of cards. The embossing is beautiful and I can't wait to get my hands on this bad boy. Tomorrow, I will share with you some more CHA fun, but now lets announce the WINNERS of my Blogiversary giveaway! First off, I have to say thank you to everyone for all the compliments and great suggestions! Between all of you and all the wonderful things that I saw at CHA, I feel super inspired and I am hoping to gets lots of time to craft this weekend! I think all of you are amazing and I love you all! Winners, please send me an e-mail and let me know what e-mail address you would like your prize sent to and CONGRATULATIONS! You gals are awesome! Don't forget today is the last day to enter for the giveaway! Just go HERE and enter in a comment telling me what you would like to see me do in the future! Have a great day everybody and I will pick the winners tomorrow! This week is my Blogiversary!! Things have been so busy this summer! I have done so little crafting the last few weeks because I am making the most of the summer before my son goes back to school, so I apologize for not having more on the blog here for all of you! This coming Thursday is my blogiversary, so the best way to celebrate is to have a giveaway!! I have three great prizes for the winners. If you have been following my blog then you know that one of my favorite places for SVG files is Lettering Delights. 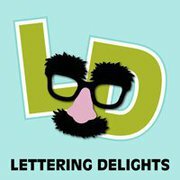 I will be giving away three gift certificates to Lettering Delights so that you can add to your collection any way that you want! The Grand Prize winner will get a $25 gift certificate, 2nd place will get a $15 gift certificate, and 3rd place will get a $10 gift certificate. To win, simply leave me a comment on this post letting me know what you would like to see me do in the next year on my blog. This can be videos, techniques, certain types of projects, etc. You need to leave me a comment before the end of the day Thursday, and I will post the winners on Friday. Good Luck everybody and have a great day!